Fantastic shot! Where was this taken if you don't mind me asking? The reason for this is, that in former times there was a kind of open hut in the middle, where the aristocrats stood with their firearms and shot the deer, that was passing the open spaces. Nowadays they are kept open out of silvicultural reasons. 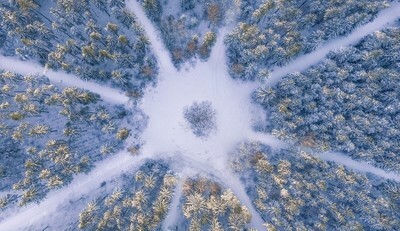 It was nearly too cold for my drone this day and the snow was very high, but the trip was worth it!